Before the dismantling of the garden at Yemple, I wanted to get a complete photo study of all the new features. 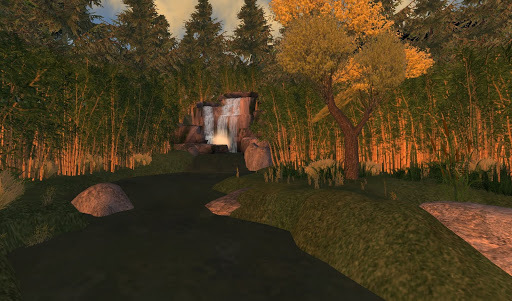 The garden at Yemple is gone but there were some really nice features that I haven’t presented before. 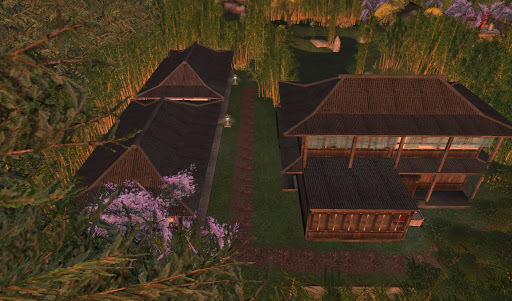 I’ve published several studies of the tea garden side of the sim, this one is of the Harvest Moon Cafe. This was the trail leading from the tea garden through the bamboo forest. 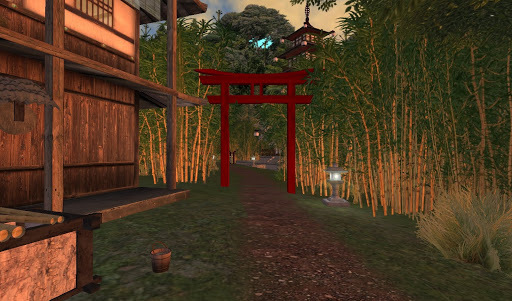 After passing through the village torii gate I turned and looked back at the trail. There’s something about a bamboo forest that fills my spirit. I enjoy the path as much as any garden feature. The path to the cafe leads through the back of the property. You can see the rear of the Harvest Moon Cafe on the right and two rental house on the left. 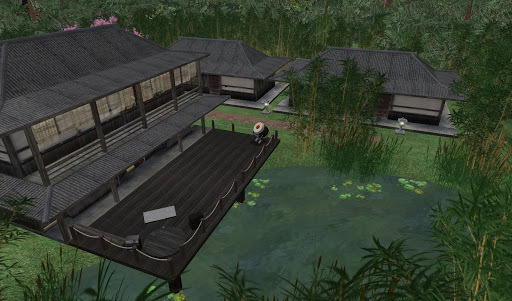 And there it is, sitting on the Meandering Pond, the Harvest Moon Cafe with it’s large deck for dancing. Even though we lived at Yemple for only a short time, we danced many evenings at the cafe before going to bed. Here’s a photo taken from the cafe’s deck. In the distance you can see The Heavenly Falls. I particularly like the last photo. It is taken from the alongside the pond. 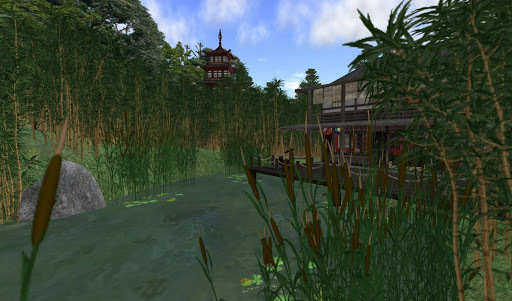 You can see the cafe hiding behind the bulrushes and far in the distance the pagoda reaches into the sky. I enjoyed creating this side of the garden. I’m still sad that it’s gone but I did made the decision. And I hope the new garden will surpass this one. 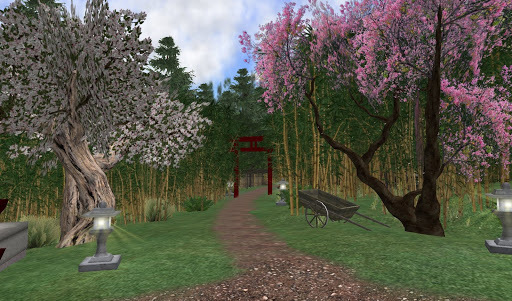 This entry was posted in Features and tagged Photography, Second Life, Zen Gardens. Bookmark the permalink.